Flicking through a food magazine at a friend's place recently I discovered a recipe for Eton mess. It made me laugh – I've made it twice, but both times it was the result of a pavlova disaster and not the dessert I actually set out to make. So strong is the stuffed-up pavlova = Eton mess equation that it's even the subject of a popular myth. Legend has it that the English dessert was invented after a meringue and cream pudding went flying at a 19th Century cricket match. Apparently, rather than wasting the dessert it was scooped up and served in individual bowls. 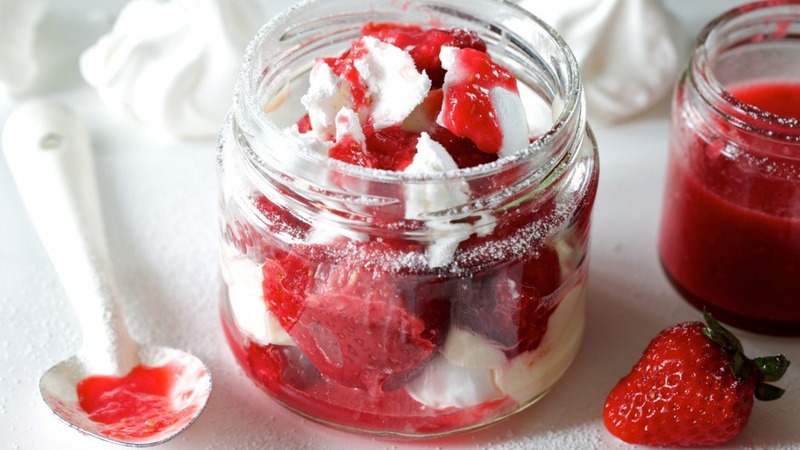 Even if it's just a story, it is a relatable one – how many of us have had our pavlova dreams shattered only for Eton mess to rise, phoenix-like, from the meringue debris? It's also a brilliant example of how to turn a cooking disaster into a triumph and worth keeping in mind next time things go wrong in the kitchen. So how do professional chefs turn their disasters around? Roy Ner is executive chef at Sydney's Nour. He tells Good Food that a recent kitchen mishap led to the creation of a new technique that the popular restaurant now uses every day. Overcooked the chook? Make a soup. Cake's a bit dry? Make a trifle. "Last spring, we created a swordfish dish with green freekeh. One of the young chefs boiled the freekeh in water and salt, instead of slowly simmering the freekeh in fish stock like we usually do. Not only was it water and not stock, but he overcooked the grain until it was completely mushy, tasteless and sticky. "It then came to my head that if we blended it into puree, then dry and fry it, we could make it into crispy chips. The chips with the right seasoning, actually ended up elevating another dish that I was trying to create," Ner says. Since accidently discovering the technique, grain chips have become integral to several Nour dishes. Stephen Clark, head chef at Melbourne's San Telmo, has also managed to create success where disaster loomed. "At Thomas Corner Eatery, one of the team overcooked the meat for the roasted pork belly that was on the menu. We turned it into pulled pork sandwiches, which ended up being a best-selling dish for the next year," he says. For those of us who lack technical know-how in the kitchen, what are the golden rules for turning cooking stuff-ups destined for the bin into something, well, edible? I asked a few top chefs to share their tips. Stephen Clark says the most important thing is to avoid panicking. Take a few moments to calm down and then look for a way out. "Overcooking isn't a problem. Instead, look for another recipe in which the overcooked ingredient can be a well-cooked ingredient. For example, if you're aiming to soft boil an egg, and overcook it, use it to make [cooked egg] mayonnaise* or tartare sauce," he says. Roy Ner says it's very important to keep an open mind. "Food can always transform into a different dish. For example, overcooked roast vegetables can transform into an amazing soup, or a puree that can elevate a ragout for the next time you cook," he says. Patrick Friesen, executive chef of Queen Chow in Sydney's Enmore and Manly, says most things can be repurposed. "I'm not a huge fan of leftovers so I often turn today's leftovers into a new meal tomorrow. Overcooked the chook? Make a soup. Cake's a bit dry? Make a trifle. Lemon tart leaked through the bottom of your tart casing? Add some toasted meringue on top and you've got a lemon meringue pie," he says. Likewise, Rhys Hunter, head chef at Pontoon in Melbourne, says thinking creatively means you can make the most of a kitchen flop. "If you have a cake that didn't rise, think about turning it into a crumb and using it in another dish or soaking it in alcohol to use in a tiramisu," he says. *Yes, this is a thing. Stay tuned for how to make your own.